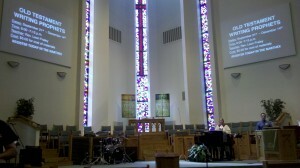 This Sunday Laura and I decided to attend Burks United Methodist Church in Hixson. We parked in a side lot and headed in a side door (not the main entrance) which led directly into the lobby area outside of the sanctuary. 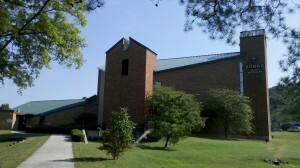 As we stepped in the door I was immediately greeted by a familiar smell…the United Methodist Church smell. Don’t ask me how or why, but most United Methodist Churches have “a smell”. I don’t know if there is a certain type of wood used in the construction or where it comes from, but I leaned over and whispered to Laura “it smells like a United Methodist Church” and she laughed and agreed, apparently realizing that there was truth to the statement. We walked over to the information booth in the lobby and were enthusiastically greeted by Barbara, who proceeded to explain to us an upcoming schedule change for the worship service and Sunday school class times and then took us on a quick tour, showing us where the “young couples” class met, which she suggested we attend. Barbara introduced us to Leon, the Pastor of Discipleship, who gave us more information about the different Sunday school classes and invited us to attend the movie “Courageous” on a night when Burks United Methodist had rented out a local movie theater in order to get lower ticket prices for members and guests. It was obvious that Barbara and Leon wanted to get us connected to other small groups or classes at Burks UMC, and I appreciated the sense of urgency and effort they put forth in making sure we knew when and where to go. I would much rather have someone guide me through the initial process of learning my way around a new church than try to figure it all out on my own or from a website, which it sadly seems like the best you can hope for at some churches these days. As time for the worship service approached, Laura and I headed on in to the sanctuary and found seats in a pew just a couple of rows from the front. 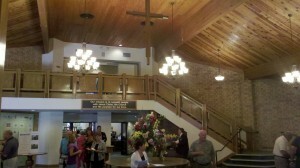 The sanctuary was large with a high ceiling and white walls with brick and wood trim. The pews were wood with green cushions, and greet carpet led to the pulpit area at the front of the room where narrow stained glass windows rose vertically from the floor to the ceiling. Shortly after sitting down, a man sat in the row in front of us and turned around, introducing himself as Brian, and then asked if we had a child that was singing in the service after he saw that I had my phone out ready to take pictures. I told him we were visiting and then noticed that there were quite a few parents sitting in the front rows with cameras ready…signalling some type of children’s choir performance. We shared a few more minutes of conversation and then with the accompaniment of traditional pipe organ music, the choir made their procession to the pulpit wearing shimmering robes, followed by Pastor Nathan Malone, who welcomed the congregation and then introduced the first hymn. It has become so rare to actually use a hymnal in today’s churches, Laura and I fumbled around with it a little trying to find the right number and then flip to the page. Once I had it open it was like riding a bicycle, and I actually prefer singing songs with written music, which if you can read music allows you to sing along even when you don’t know the song (unlike modern worship music with words on a projection screen). 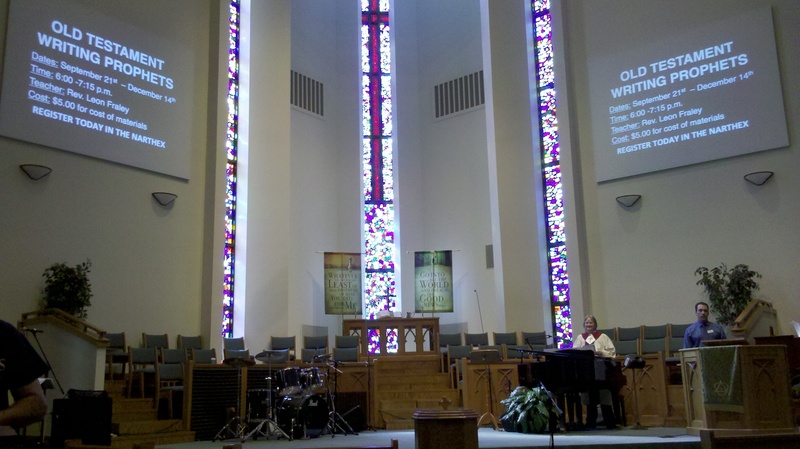 I did notice an empty drum kit and other instruments on stage, which are used for the contemporary service, but they sat vacant throughout the traditional service while we were treated with beautiful arrangements for the piano and organ instead. 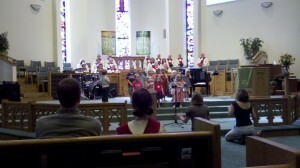 After the opening hymn everyone was invited to greet the people around them and then the children (ages 3-5) came up for their performance. 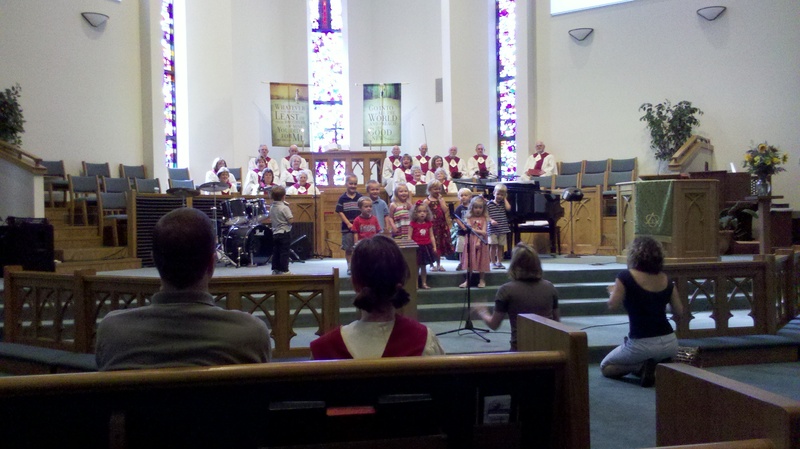 I’ve always felt like United Methodist churches do a great job of getting the children involved in worship service, where the entire congregation can see them and enjoy them. Watching this group of toddlers singing was wonderful and included all the usual laugh-out-loud moments when they do the things that only kids do. Pastor Nathan then invited a family to the front for a child baptism, and also asked friends and family to come forward to lay hands on them during prayer. He encouraged the congregation to surround and support the children with love and then provided an explanation (which he referred to as a “teaching moment”) of child baptism, pointing out that it is about honoring God rather than the individual. After the baptism ceremony we proceeded through the traditional United Methodist responsive readings and guided prayers, ending with the Lord’s Prayer, which I love reciting in church with other believers. The collection time was accompanied by a montage of patriotic songs (“America”, “God Bless America”, etc) commemorating the tenth anniversary of the 9/11 terrorist attacks, and then after a few more announcements Pastor Nathan stepped into the wood podium to begin his sermon. As Pastor Nathan began, I wondered what types of sermons were being delivered at various churches around the country that day. I’m sure some were about forgiveness, some may have been about revenge, some were probably about emotional healing, and maybe some about peace, but Pastor Nathan began by remembering what he went through trying to prepare for his sermon on the Sunday following the attacks back in 2001. He reflected on the “What’s next?” question that consumed so many people in those days and how many people struggled through the progression of dealing with shock, anger, and the desire for revenge. He then made a reference to Scripture that I thought was an excellent comparison when he brought up Jesus dealing with the beheading of John the Baptist. Jesus and John the Baptist were relatives and when he was put to death the Bible says that Jesus went off to a deserted place alone. My guess would be that he spent this time in prayer, which we must all do to deal with such tragic moments in life that bring about the opportunity to fall victim to the temptations of Satan. Pastor Nathan noted that even ten years later the spirits of fear, hatred, division, and suspicion are continuing to be perpetuated by many around the world based on what happened on 9/11. He made sure to explain that those and other terrorist attacks are not the true way of Islam, but are horrendous acts committed by extremists. He also made sure to point out that there are Christian extremists out there as well, and he contrasted the recent protests and arson at a mosque construction site in Murfreesboro with the opposite reaction of Heartsong Church in Memphis, which put out a sign welcoming the Memphis Islamic Center to the neighborhood. Pastor Nathan delivered the sermon more like a teacher than a “preacher”, but with an affirming voice of confident authority. The sermon was thought-provoking and timely and left room for personal reflection without forcefully inserting dogmatic points of view. As the service ended and we left the building the mood was slightly muted by the serious message and the anniversary that was on everyone’s mind. Despite the memories of that tragic day ten years ago, I can honestly say looking around at the faces leaving church, the Spirit was at work assuring believers of the glory of heaven and the peace of Christ. His Kingdom is free from tragedy, heartache, pain, and all evil…I look forward to the day when I get to enter that wonderful place. Christian churches, with 25-35 something single groups, which have a Sunday night service? PS, not 100% sure but I would imagine a lot of the larger churches would have pretty active singles groups. We met with a “young couples” group at Abba’s House, so I would assume they have one. That is a great question and I hope to have a remedy for the problem of finding specifics about local churches online (which is currently impossible) sometime in the near future. Until then, maybe other readers can offer some help?